People morally evaluate norm violations that occur at various distances from the self (e.g., a corrupt politician vs. a cheating spouse). Yet, distance is rarely studied as a moderator of moral judgment processes. We focus on the influence of disgust on moral judgments, as evidence here has remained inconclusive. Based on feelings as information theory and the notion that disgust evolved as a pathogen avoidance mechanism, we argue that disgust influences moral judgment of psychologically distant (vs. near) norm violations. Studies 1 and 3 show that trait disgust sensitivity (but not trait anger and fear) more strongly predicts moral judgment of distant than near violations. 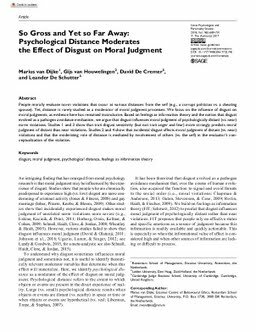 Studies 2 and 4 show that incidental disgust affects moral judgment of distant (vs. near) violations and that the moderating role of distance is mediated by involvement of others (vs. the self) in the evaluator’s conceptualization of the violation.